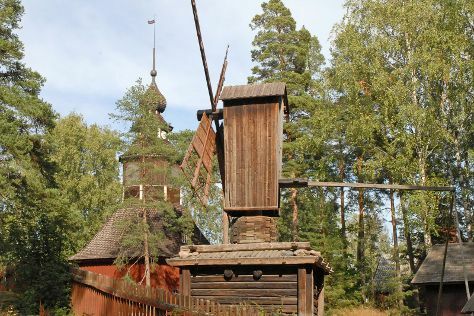 Your cultural itinerary includes sights like Seurasaari Island and Open-Air Museum and Linden Esplanade. Step off the beaten path and head to Teijo national park and Nuuksio National Park. You'll find plenty of places to visit near Helsinki: Porvoo (Cathedral of Porvoo, Porvoo Old Town, & more), Pyhan Katarinan kirkko (in Karjaa) and Hanko (Bellevue Beach & Tulliniemi Nature Path). Spend the 12th (Mon) exploring nature at Ekenas Archipelago National Park. Spend the 17th (Sat) exploring nature at Valkmusa National Park. And it doesn't end there: take a stroll through Katajanokka, delve into the lush surroundings at Niivermaki Nature Conservation Area, admire the masterpieces at Kansallisgalleria, and explore the striking landscape at Hiidenvuori. To find more things to do, traveler tips, other places to visit, and tourist information, read our Helsinki travel route tool . If you are flying in from Spain, the closest major airport is Helsinki Vantaa Airport. In August, daytime highs in Helsinki are 24°C, while nighttime lows are 13°C. Wrap up your sightseeing on the 17th (Sat) to allow time to travel back home.